Saturday night's exploring found two excellent bars to add to the riches of south Seattle. Neither had extraordinary drinks, but their decor and their vibe put them on my highly recommended list. Remodeled about a year and half ago by the owners of 9 Lb Hammer, Loretta's Northwesterner has the feeling it's been around for a hundred years. 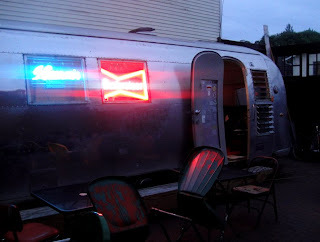 It has three distinct ambiances: The main bar is lovely dark wood and glowing, vintage beers signs, and a very classic tavern feel; out back there is a summery, open patio area, with another bar; and the final touch is parked in this patio area -- an Airstream decked out in a swanky, vintage 60s/70s look, with enough vinyl and turntables to have your own party. The patrons are a nice mix of grizzled, old veterans and a younger crowd. Historical Notes: Loretta's opened in May 2008, but the structure was built in 1918 and there's been a bar there at least as early as 1939 (the city guide lists a beer parlor owned by Mrs. Lou Mansfield). The location hosted Kelly's Tavern for many years -- by 1948 and into the 1970s, though it moved across the street by the 1980s.